The End of Issue No. 4 – Cover Poll! And Issue No. 4 ends with a bang! Thanks for reading! Things may not be looking all that great for our heroes, but they’re looking up for you because you get to help me pick the cover for this issue! That’s right. It’s time for the Cover Poll. First up, we have Dopplegangers. 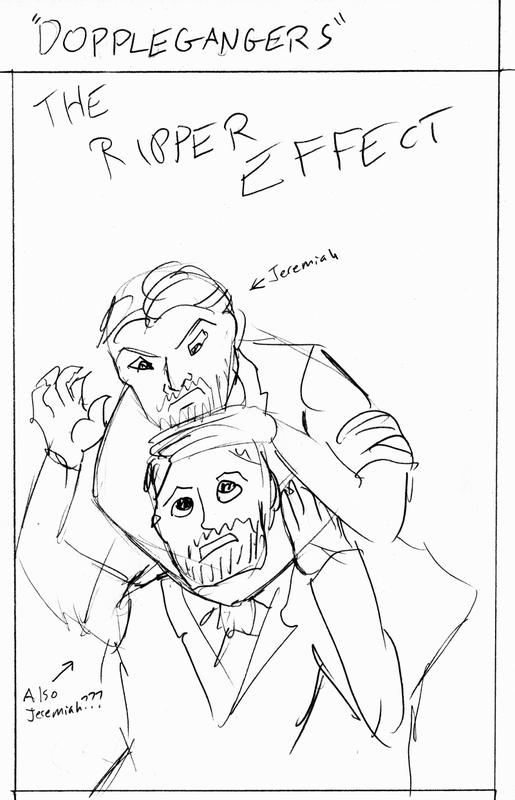 In honor of the many appearances of Jeremiah von Brandt in this issue, we have … Jeremiah von Brandt fighting Jeremiah von Brandt, one with the other in a headlock, while the latter of the two struggles to break free. Next, we have the Ominous Trio! Yes, that’s Stryke, Stiletto, and The Entity looming over the unconscious bodies of Firecracker and Rosary. I’m not sure exactly how the perspective will work here — whether we’ll have full bodies for Stryke and Stiletto or if they’ll be cut off and it’ll be more of a collage — but you get the idea. And I’m going to aim for the Entity to be just barely visible so you don’t really notice he’s there until after you read the issue. 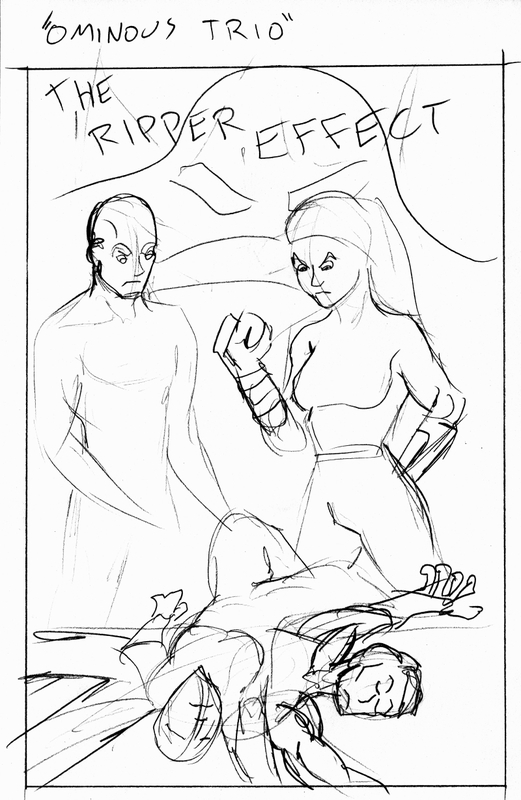 Basically, he’s too obvious in the thumbnail drawing and that will be dialed back in the final if this one is selected. But perhaps you’d prefer I not spend much time on the cover, and get back to drawing you new pages. Understandable! In that case, perhaps you’d like to take a look at “Phoning It In”! 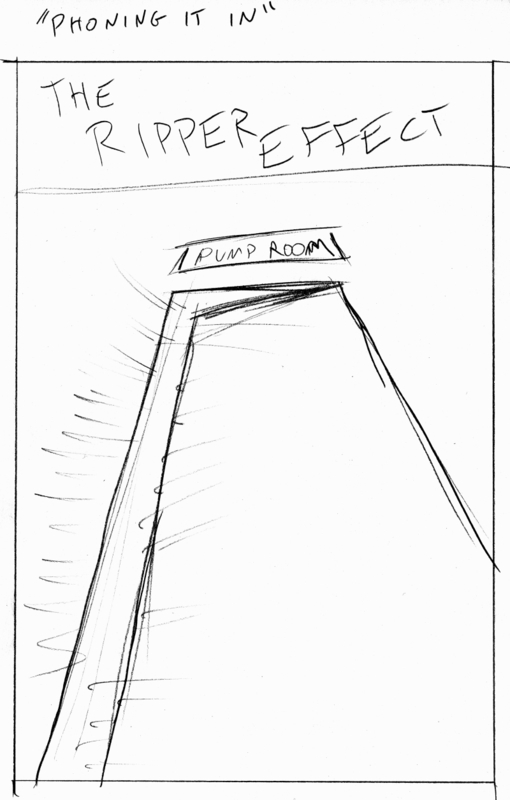 … In which I limit the number of lines drastically and attempt to draw a cracked door in an ominous fashion. Heck, the door doesn’t even open that way, but I claim artistic license I guess. There’d be either a bright light emanating from within the Pump Room, or perhaps it will be dark and eerie. So, those are the choices, unless I come up with some brilliant fourth option before anyone votes. Please vote and feel free to suggest alterations! Which design should I use for the cover to Issue No. 4? The Poll will close on October 13, 2017 at 5:00 p.m. PDT.